This bag has upwards of 200 corks. Some are pretty, and I’ve set those aside with the idea that I’ll do something fancy and decorative with them. I’ve made a trivet with some of them. But the rest has been sitting in my craft cabinet waiting for my crafty brain to come up with a crafty idea into which I will craft them. Occasionally, I’ll purge the crap in the apartment, tossing everything that’s not nailed down. The corks, however, have survived two such purges so far. My brain keeps gnawing away at the edges of ideas for them, and so the enormous bag of corks has remained. 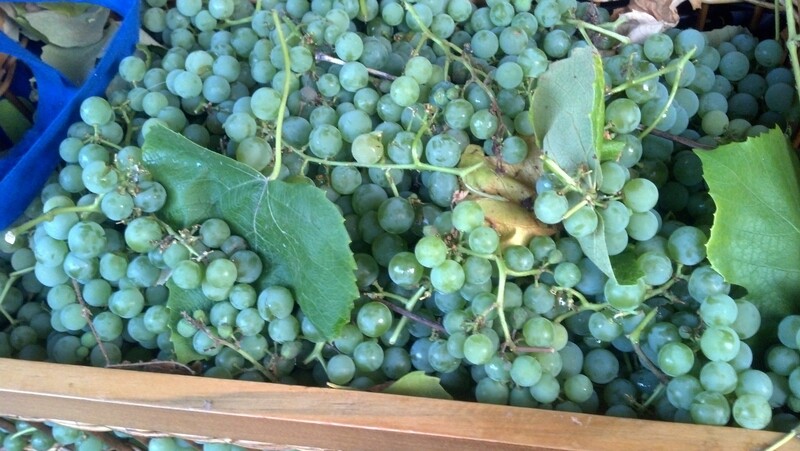 Typically, when I’ve responded to produce-picking opportunities, I am but one of several pickers who have been afforded the chance for free produce. Pears, apples, and I’ve even seen blackberries, but seriously, in Portland, nobody needs a connection to have a place to pick blackberries for free. So I expected I would have maybe a bucket or two of grapes that I could turn into something yummy. Jam, probably. Whatever, it’s free. I was the only picker. And the owner had probably a billion grapes. 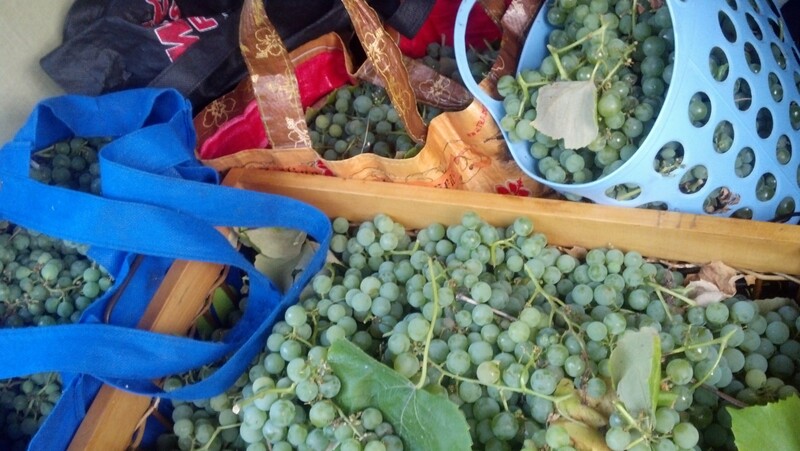 So for two or three hours, I picked as many grapes as I had means to carry. And if you’ve ever seen my car, you know I store tote bags in the back seat just in case I have to run to the store. 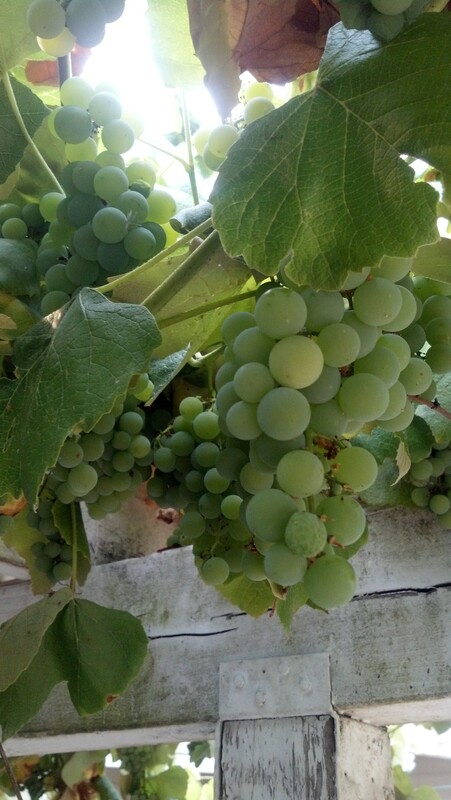 I also happened to have my beautiful new wooden crate sitting there, so I swooped into the backyard of the owner of the grapes and picked to my heart’s content. And then a little beyond it. 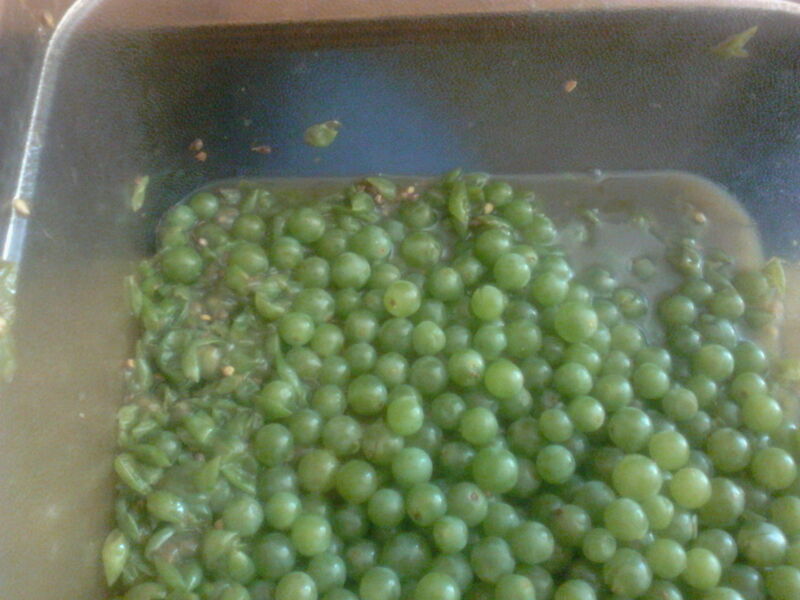 I now have about 85 million green grapes (give or take) in my kitchen which I will be turning into white wine. 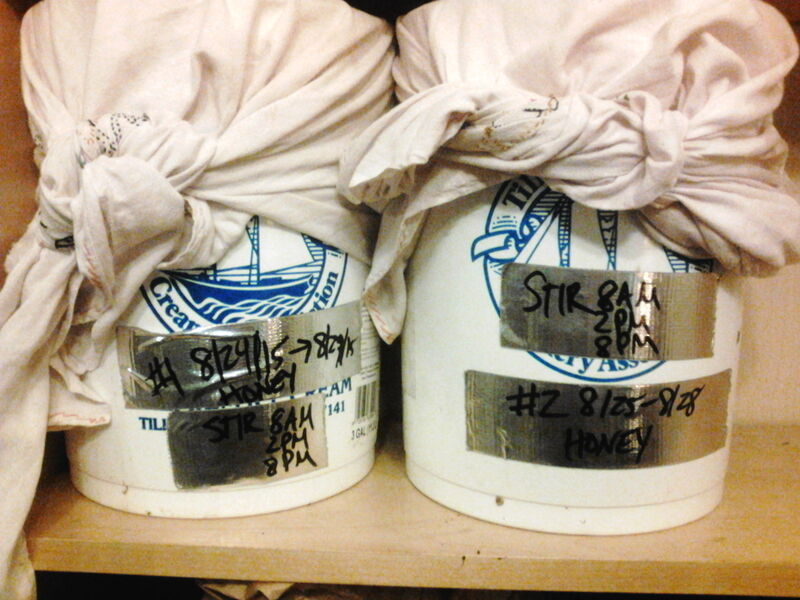 Some of them have been cleaned, de-stemmed, smashed, mixed with honey and deposited into Tillamook ice cream 3-gallon containers (obtained from the Tillamook store in Tillamook, OR for .50 apiece, thank you very much). That took two days. 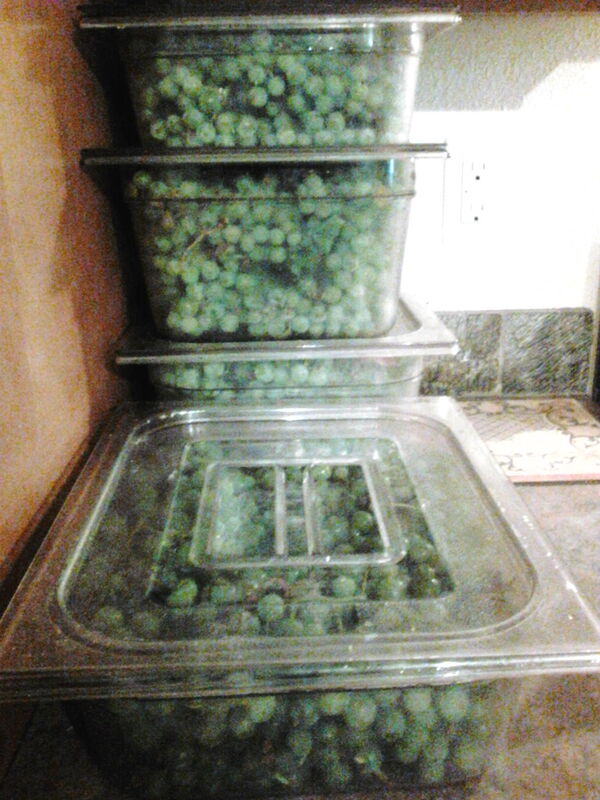 I have at least one more 3-gallon vat worth of grapes yet to process. 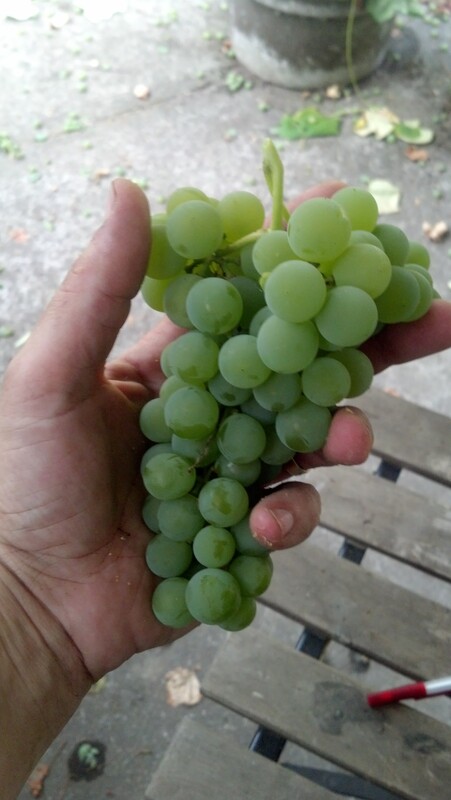 By the time I’m finished, I will have touched every single one of these grapes. These janky vats of wine, which smell terrific, are my latest foray into “sure, let’s try and make something we’ve got no experience making!” They are resting gently on my bookshelves, awaiting the next scheduled stir. The rest are on the counter in their Craigslist-obtained professional kitchen prep containers (FREE! damn, I love Craigslist) waiting for clean/destem/smash/mix/deposit. Tim had the brilliant idea of scouring the recycle bin on Sunday morning for used wine bottles. FREE! I think we’ll need about a dozen. Tim wants to call this Chateau Marguerite Sauvingon Blech. But I definitely know what I’ll be doing with the corks.